Studio Essentials: Linen Wear — The Denizen Co.
We at The Denizen Co. are huge fans of linen – a breathable and utilitarian fabric that grows softer with wear. The texture-rich natural fibers of a linen blouse are a perfect companion for a Friday afternoon at the office. Click through our favorite small batch designers and makers from around the world that specialize in unique and thoughtfully designed linen wear. A high quality linen designer based in Cape Town. Offers small run linen clothing and leather footwear and accessories. Jane Sews’ luxe stretch linen collection offers all-day comfort and a refined silhouette. The Vero Skort is our personal favorite. A Minnesota-based design studio specializing in small batch limited edition clothing. Boxy silhouettes may be in, but Hackwith pieces like the Button-Up Arm Tie Top show that quality comes in all shapes and silhouettes. A local favorite! 7115 was founded by designer Szeki Chan in 2008 in the Lower East Side. Szeki’s designs are known for their clever details and everyday functionality. We’re so glad that the Linen Sumo Jacket was added to Szeki’s signature collection this year. A Los-Angeles-based design studio led by Japanese designer Alexander Yamaguchi. Black Crane pieces are minimal yet remarkably distinct. Nothing like a solid cocoon fit dress to make you feel put-together yet relaxed and comfortable. 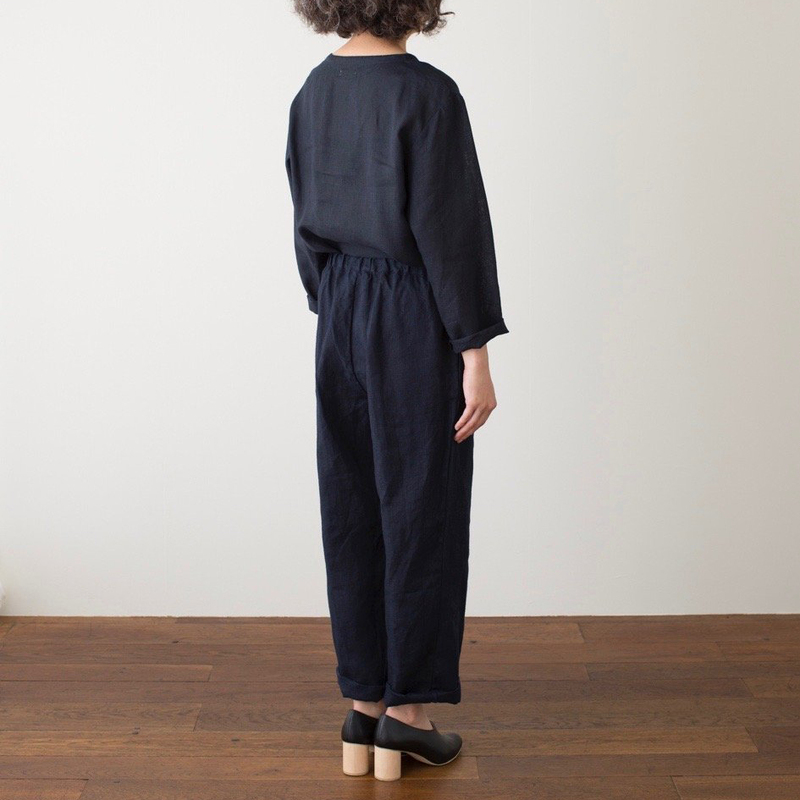 We love Black Crane’s Bud Dress / T-BD06. A Nashville-based design studio specializing in high quality natural linen products. Elizabeth Suzann’s pieces are known for their unique silhouettes and functionality. If there’s one studio jacket you need, it’s Elizabeth Suzann’s Clyde Jacket, a mid-weight linen jacket with a large shawl collar and massive pockets. Though By Mölle does not have an apparel section, we could not help but feature this small linen studio based in the Netherlands due to their high quality craftsmanship. Are you a linen purist? These By Mölle duvet covers are made out of 100% pre-washed yarn-dyed linen, giving it that texture-rich, lived in feel. A Tokyo-based linen studio specializing in home and lifestyle goods. These long-lasting pinstripe kitchen cloths get softer and more absorbent with each use. What’s not to love?